"Her many sins have been forgiven, or she would not have shown such great love." The “theme” of the First Reading, Psalm and Gospel today is “forgiveness of sins”. 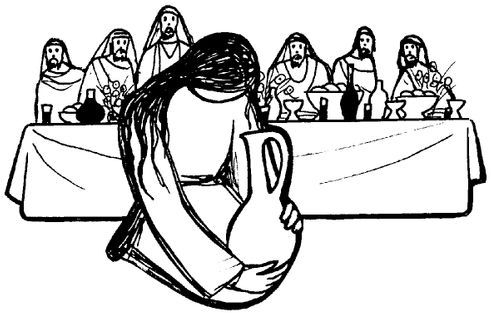 We hear the touching Gospel story, of the “woman with a bad name in the town” coming to anoint Jesus’s feet. Living inspired by the love of Jesus is the key to our discipleship - his crucifixion is the sign of his love, which is in itself the forgiveness of sins. First Reading: 2 Samuel 12:7-10.13. David has had an affair with Bathsheba, Uriah’s wife: when she became pregnant, he sent Uriah to the front line of battle so that he would be killed, and would not find out. This is David’s compound sin, which the prophet Nathan now lays before him. There are two sections to Nathan’s speech: first God sums up what he has done for David - the signs of his love for him. Then he accuses David, of taking Uriah’s wife, and having him killed. In between these two parts is the question “Why have you shown contempt...” - this must stand out in the drama of this reading: you build up to it, and come down from it. Then there is the final paragraph, which in the context of today’s Gospel is the most important part of the reading: David’s repentance. A pause after God’s accusation will emphasise the sorrow of David’s confession. Then another pause, before we hear of the Lord’s forgiveness of David. Make sure you separate accusation, confession and forgiveness when reading. By “the Law” Paul means the Law of Moses - the way of the Jewish Religion. His point is that, now that Christ has come, died and risen, it is faith in Jesus that justifies us. This is a difficult reading to proclaim, and therefore difficult for the congregation to follow: you, the reader, will need to highlight signposts so that the listeners can follow you through the reading. This means you have to work them out first. For example, in the first sentence, the “signpost words” are “righteous”, “not”, “Law”, faith” and “Jesus”. So the sentence reads: “We acknowledge that what makes a man righteous is not obedience to the Law, but faith in Jesus Christ.” You need to go through the whole reading, marking the “signpost words” in each sentence. Take special care with the sentence beginning “I have been crucified...” Paul is pleading quite passionately in this reading - so make sure you can get beyond the “problem of the words and meaning” to feel the eager tone of Saint Paul’s appeal today. Only God forgives sins. Since he is the Son of God, Jesus says of himself, "The Son of man has authority on earth to forgive sins" and exercises this divine power: "Your sins are forgiven." Further, by virtue of his divine authority he gives this power to men to exercise in his name. Christ has willed that in her prayer and life and action his whole Church should be the sign and instrument of the forgiveness and reconciliation that he acquired for us at the price of his blood. But he entrusted the exercise of the power of absolution to the apostolic ministry which he charged with the "ministry of reconciliation." The apostle is sent out "on behalf of Christ" with "God making his appeal" through him and pleading: "Be reconciled to God." The tenth commandment requires that envy be banished from the human heart. When the prophet Nathan wanted to spur King David to repentance, he told him the story about the poor man who had only one ewe lamb that he treated like his own daughter and the rich man who, despite the great number of his flocks, envied the poor man and ended by stealing his lamb. Envy can lead to the worst crimes. "Through the devil's envy death entered the world"